Last weekend we had our first national comp in the Olympic Combined format and it was also the first Olympic Combined comp for me. I participated in the World University Championship in the Combined event, but the format was a little different as there was just a result calculated from the separate disciplines, and there was no combined final. It is a competition with all three disciplines of climbing included. 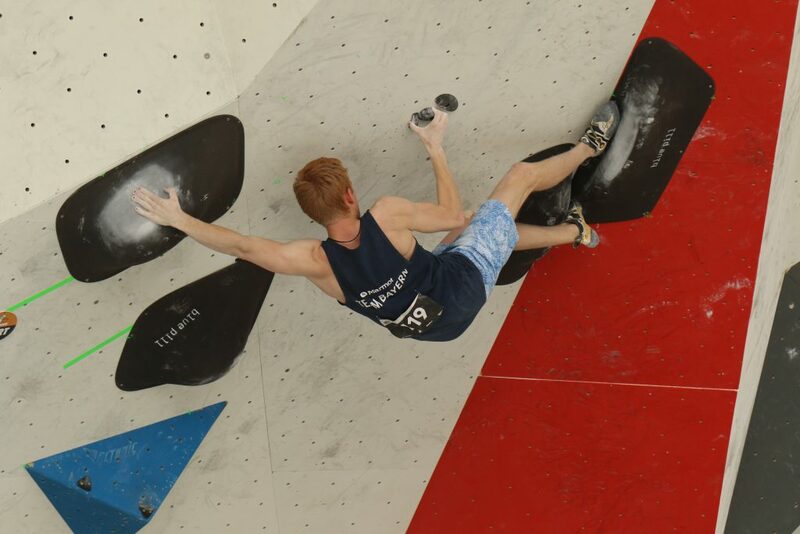 In the Qualification, you start off with Speed, then proceed to Bouldering (Four Boulders in Interval format) and finish off with Lead (One Route Onsight). The separate rankings of each discipline are multiplicated and the six climbers with the lowest score will compete again in Finals on the next day. In finals, speed is a knockout round with the fastest loser from the Quarterfinal still proceeding to Semifinal. Afterwards, will be the Bouldering Final with 4 Boulders in the Worldcup FInal format (All competitors climb the first boulder, the all climb the second one and so on) The last discipline, once again, is Lead climbing. The rankings in these three disciplines are once again multiplicated, which results in a final combined ranking. I felt in really good shape for bouldering and speed but did not train lead at all. Starting with speed, I was able to get a good run with under 9 seconds. Unfortunately, I slipped in the second run and couldn’t improve my time further. This put me in 4th Place, which a was pretty satisfied with. I knew that Lead is my biggest weakness at the moment so I tried to pace through the route quite quickly. When I was already pumped I found a kneebar with a no hand rest, but I could only recover a little from my pump xD Still 30+ moves on a rope is more than I could have hoped for 😀 I was really glad that Lead was the last discipline as I was pumped for at least 2 hours xD With a 16. Place in Lead, I qualified for finals in 3rd Place. Bouldering wasn’t as good as the day before. The first boulder was quite easy and I think all competitors flashed it. The second boulder really proved our tilt resistance. Some of us (like me) already hit their while speed climbing and thus had already bleeding knees. Not being forced to do kneebars on a volume surely wasn’t the nicest thing -.- The third boulder had a really cool dynamic move to the bonus, but the was super morpho or super hard. The fourth boulder was awesome, but a little bit too hard. With a flash on the first boulder and four Zones, I placed 3rd in the Bouldering final too. The lead final was a complete disaster. At around the fifth clip, you had a small dyno, which surely wasn’t hard at all. While building up momentum, my foot slipped and I fell. Obviously, I was finished 6th in Lead, which resulted in me closely missing the Podium as 4th. Anyway, I am super happy with my performance and my training progress. This was a really good opportunity for me to learn more about the Olympic Combined format and get some experience in it.